CHICAGO - The Washington Nationals hit the halfway point of the season tied with Atlanta for the NL East lead. Adam LaRoche will take that. "I like our position in the standings and I like how our team is playing," LaRoche said after Washington swept a day-night doubleheader from the Cubs on Saturday. LaRoche and Wilson Ramos homered, Blake Treinen earned his first major league win and the Nationals beat Chicago 7-2 in a rainy nightcap. 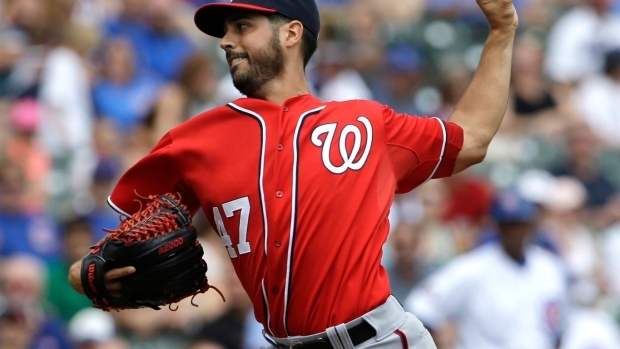 Gio Gonzalez pitched two-hit ball over seven innings in the opener for a 3-0 victory. In the second game, Washington tagged Jeff Samardzija (2-7) for six runs over five innings to salvage a four-game series split. LaRoche led off the second with a long drive to right for his 11th homer, and Ramos connected to start the fifth, sparking a four-run rally that made it 6-2. Making his fifth major league start, Treinen (1-3) allowed two runs and four hits in five innings. The right-hander was recalled from Triple-A Syracuse as the 26th man on the roster for the doubleheader. "It means a lot," he said about the win. "I'm definitely excited, that's for sure." Ross Detwiler pitched three perfect innings for his first career save. The only runs for the Cubs came on a two-run homer by Luis Valbuena that tied it at 2 in the fourth, right about when the rain started falling. With two outs in the inning and Nate Schierholtz batting, play was stopped for 55 minutes. Once the game resumed, it didn't take long for the Nationals to regain the lead. Ramos connected on the first pitch of the fifth for his second homer, and Washington sent up nine batters in the inning. With two outs and a man on first, three straight singles by Anthony Rendon, Kevin Frandsen and Jayson Werth resulted in two more runs. First baseman Anthony Rizzo then let LaRoche's hard smash get by him for an error, bringing in Frandsen to make it 6-2. "Coming out of the rain delay they jumped on me right off the bat, and then they hit some fastballs over the plate and hit them up the middle," Samardzija said. "Made me keep throwing pitches. Like I said, they did a good job. They were ready out of the break." In the first game, Gonzalez dominated in his third start back from the disabled list, outperforming Dallas Beeler in the righty's major league debut. Rendon had three hits, including a two-out double against Beeler in the sixth before scoring the game's first run on a wild pitch. Rendon added an RBI triple off Justin Grimm and came home on a sacrifice fly by LaRoche against Wesley Wright in a two-run eighth. Denard Span chipped in with two hits and scored a run, and the Nationals snapped a three-game losing streak. Gonzalez (5-4) struck out seven and walked two while improving to 2-0 in three starts after missing a month because of inflammation in his pitching shoulder. Tyler Clippard worked the eighth and Rafael Soriano finished for his 19th save in 21 chances. "Obviously, coming (off) the DL and trying to work your way back is going to be a process," Gonzalez said. "It's not going to happen overnight. It's good to see, little by little, using fastball and changeup at the same time. It's good to know when you need them they'll be there." Beeler was about as good as Gonzalez. Called up from Triple-A Iowa as the 26th man, he pitched four-hit ball while allowing an unearned run in six innings. Beeler also singled in his first at-bat when he lined the first pitch he saw up the middle in the third, drawing big cheers from the crowd. "I was a lot calmer than what I thought I'd be," he said. "I walked out there, took a deep breath, threw my warmup pitches, kind of looked around again, exhaled and I was like, 'All right, same game I've been playing for the last 20 years.'" NOTES: Nationals OF Bryce Harper hit three homers and drove in five runs in a rehab game for Double-A Harrisburg. The 2012 NL Rookie of the Year is working his way back from a torn ligament in his left thumb. He went 4 for 5 as the DH against the Cleveland Indians' Akron affiliate. Washington manager Matt Williams said he's not sure if Harper will play another game for Harrisburg on Sunday. The Nationals are optimistic he will return early in the week, if not Monday, when they open a three-game series against Colorado. ... The Cubs have their first scheduled Sunday off in 82 years because of the annual Pride Parade in Chicago. The last one was on June 19, 1932. Chicago played the Giants in New York on a Saturday and then went to Philadelphia on a Monday.